or be the better sailor? If you answered "the better sailor," then you've already grasped the concept of one-design sailing. If you answered "the faster boat owner," you may take some convincing but we're willing to try! One-design sailors are committed to a concept -- sailboat racing is more fun and more competitive when sailing almost identical boats. Racing then becomes a contest of skill, not a test of equipment. You've seen this concept demonstrated by the finest sailors in the world … at the Olympics, where boats are exactly the same size and weight, with identical sails and crew. 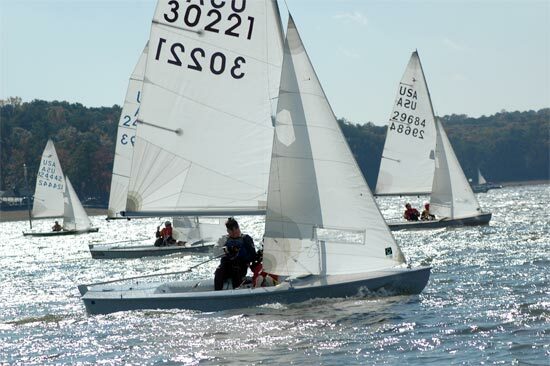 Unlike handicap formula racing where speed is a product of boat design, the specific intent of one-design racing is that the boat NOT provide any advantage to the sailor. It's the skill of the skipper and crew that outmaneuvers the competition. How? With tactics, timing and crackerjack teamwork, for starters. Well-practiced boat handling skills are a must, along with a thorough knowledge of the sailing rules. Agility is in your favor, and strength can be handy, but often sensitivity is far more important. (It doesn't matter how strong you are if you miss a major wind shift and end up on the wrong side of the course!) Boat speed matters, but sailing fast is not a guaranteed win (you still won't beat the other guy if you're on the wrong tack). In one-design sailing, headwork is the name of the game. Quite simply, it is a contest of skill. All this is not to say that we one-design sailors ignore our equipment! Keeping our boats down to minimum weight, polishing the bottom, adding or moving cleats or fittings within the tolerances of the class rules, replacing old sails with crisp new ones -- it's all part of the fun. Each class prescribes what can and cannot be done, in order to keep boats evenly matched. One advantage of class rules is to prevent radical design and equipment changes that could become too costly or make older boats obsolete overnight. So, with all that money you'll be saving, you can afford new sails AND steak dinners for your crew at the next regatta! At Atlanta Yacht Club, as at most of the inland lake sailing clubs, one-design sailing rules! Whether sailing at home or at a regatta, Thistles race only against Thistles, Snipes against Snipes, Y-Flyers against Y-Flyers, and so on, with a separate start for each fleet. So when the first Laser crosses the finish line he doesn't have to wait for his time to be computed -- he gets the gun, he won the race. It's that simple! And we one-design sailors like it that way.